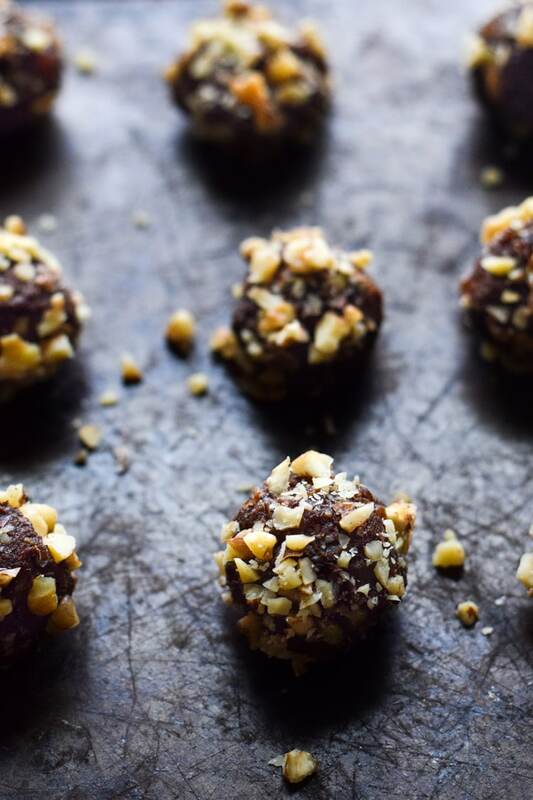 These Easy Chocolate Pumpkin Energy Balls contain only 6 ingredients, take only 20 minutes to make, and are raw, no-bake, vegetarian, vegan, paleo, dairy free and gluten free. Happy Halloween, friends! Can you believe it’s almost November? I definitely can’t. I have no idea how, but time just flew by this year. Between wedding planning, the blog, getting a new kitten and a ton of other things, I guess I haven’t been paying attention to the calendar. But nevertheless, it’s the last day of October and I’ve got one thing on my mind. I’ve only made one other pumpkin-type treat this year – this Mexican Chocolate Pumpkin Seed Granola – and I don’t even think it counts because it’s pumpkin SEEDS, not actual pumpkin PUREE. So I thought I’d update this post which was originally posted last year. It had terrible photos but the recipe is AMAZING. Now that I’ve had a little practice at taking better food photos, it’s time to really showcase these Easy Chocolate Pumpkin Energy Balls. 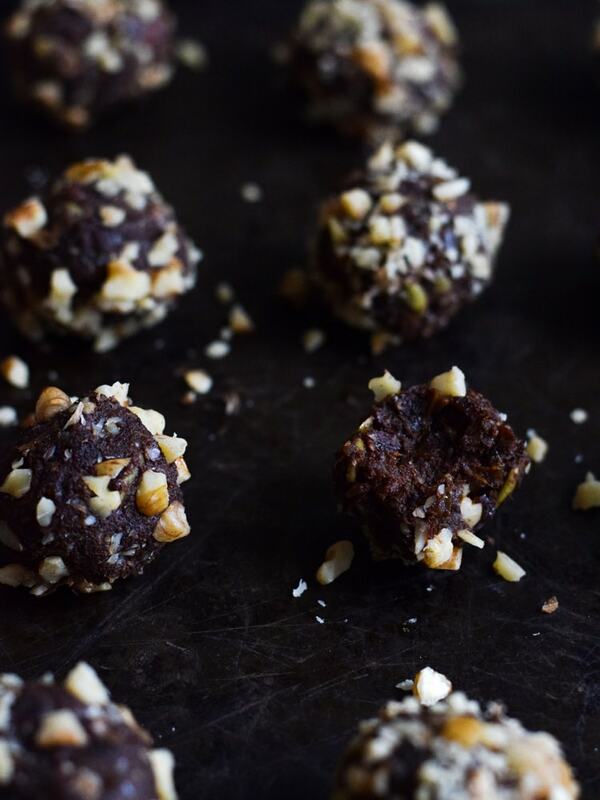 Made with only 6 ingredients, the energy balls take only 20 minutes to make and are raw, vegetarian, vegan, paleo, dairy free and gluten free. Let me know if I missed something. 😉 They’re rich and decadent, making them the perfect little treat to make for your upcoming holiday parties. They also make a great homemade gift any time of the year. Don’t tell my coworkers but I know what I’m giving them for Christmas this year. I love to cook – except when I’m tired, but even then I could be persuaded. Baking, however, is another story. I don’t quite understand what the ratio of wet to dry ingredients should be, how breads and cookies rise (do they?) and how temperature can determine whether a pie crust comes together nicely. And that’s just normal baking! Baking with gluten-free flours is an entirely different thing altogether.  Though I do enjoy experimenting with baking (see my recipes for Easy Jalapeno Cornbread Muffins, Mexican Black Bean Blender Brownies and Gluten Free Oatmeal Raisin Muffins), I often find myself giving up after three terrible attempts at chocolate chip cookies. I’ll just stick with ice cream, thank you. But when I figured out how to make a super easy dessert that required NO BAKING, I knew I just had to share it with you. 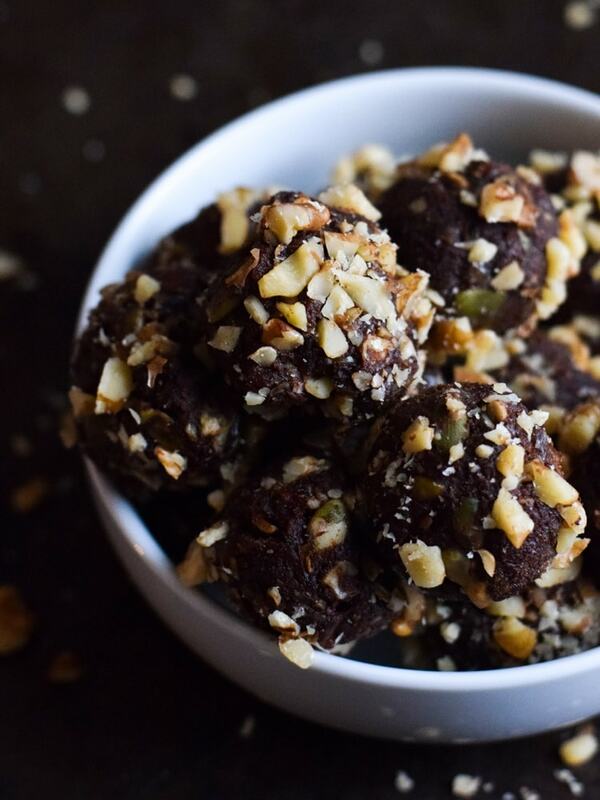 These pumpkin chocolate energy balls are so easy, you basically throw everything in a blender or food processor, pulse until smooth and roll the mixture into little balls of chocolaty goodness. Roll them in some chopped nuts to make them look a little fancy and voila! You’ve got the perfect little treat to take to a party, get together or a simple weeknight dessert. Thanks to the pumpkin, these are especially good during the fall and winter seasons when everyone wants pumpkin-flavored everything all the time. In a medium-sized bowl or plate, add the pecan chips and set aside. In a blender or food processor, combine dates and pumpkin puree. Pulse until mixture turns into a smooth paste, scraping the mixture off the sides of the blender in between pulses if necessary. Add pumpkin seeds, cacao powder and pumpkin spice to the mixture. Pulse again until the pumpkin seeds are finely diced. Separate each fourth into three evenly-sized pieces. Roll each piece into a ball until 12 balls are formed. Using the palm of your hand, roll each ball into the pecan chips, pressing lightly, until the ball is nicely coated with the nut topping. Continue until each ball is coated. Serve each energy ball in a mini muffin cup for a beautiful presentation and enjoy! Energy balls can be stored in the refrigerator for about two weeks. Ooooh these look so tasty I could eat my screen. Great job! ooh sounds delish!!! I’m making some of these for New Years! Kendra, I hope you enjoyed them. Happy New Year! Ooooo! So easy, I am definitely pinning! They look so delicious! I love truffles! Ummm, yes please! 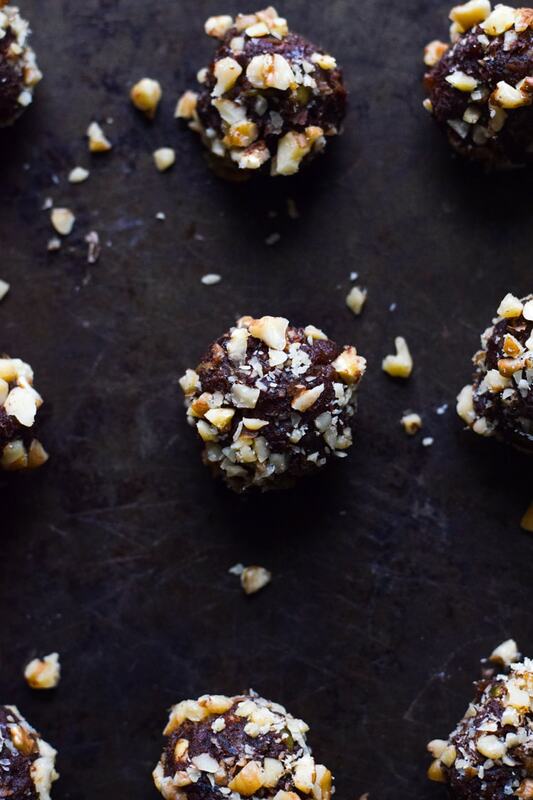 These truffles look ridiculous good and so cute! I also love that you use dates to sweeten these – so perfect! Thanks, Sarah. I’m absolutely in love with dates for that reason. They’re just so rich and make for the perfect little bite.